If you've never checked out Sweet Juniper, you should. 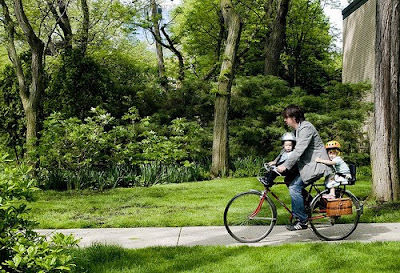 It's a great slice-of-life blog about a family that lives in Lafayette Park. We've gotten to know them pretty good (in a regular customer kind of way) this season as they've taken to biking with gusto. You must read their post about the incredible Popsycle bike. It is beyond adorable. ...well, not famous, but it is featured at OldTenSpeedGallery! OTSG is a cool blog that, with a mix of love and tongue-in-cheekiness, lets tried-but-true bikes (by their very nature that are not eligible for such glory as promised to those at FixedGearGallery) have their day in the sun. Isn't Erie pretty?